by M. & N. Minor. This "How To" guide tells the whys and wherefores of Indian clothing, personal adornment, food, ceremonies, medicine, home life, symbolism, war customs, tipis, games, stories and more. 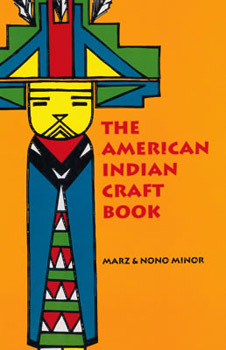 Step-by-step instructions included for a host of Indian craft projects including moccasins, headdresses, costume parts, beaded objects, etc. Information about game and war equipment pemmican, native dyes and more. 50 photographs, More than 400 drawings. 416 pages. Paperbound.